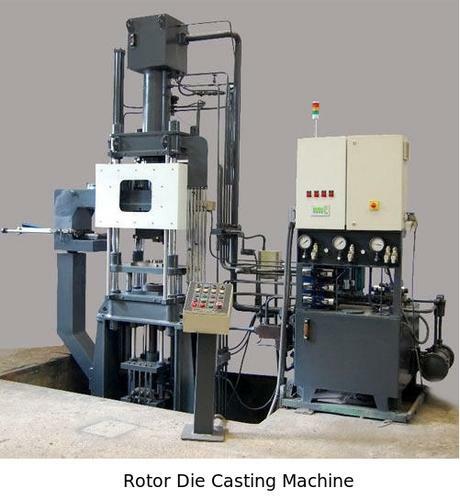 Our enterprise is involved in manufacturing and trading of Rotor Die Casting Machines. Available in tilting and non-tilting variants, the machine is used to remove the stains and roughness from the surfaces of the engines, gear boxes and many more. Our offered range is appreciated in the market for the properties like high energy efficiency, sturdy construction and simple to use. Our offered machines are provided with fixed or rotary stand as per the requests of the customers. We offer our complete assortment in various melting capacities and designs as per the specific requirements of the customers. We are counted among the leading manufacturer and supplier of Die Casting, Casting Machines And Drawing Presses. Our products are highly in demand for their superior quality and some exceptional features like operational excellence, accurate results, higher efficiency, dimensional accuracy, long service life and many more. These products are manufactured as per the prescribed industrial standards to make them meet the international quality standards. Since inception, we are focused on providing our esteemed clients with superior quality products at competitive rates and within the stipulated time frame. We have an ultramodern and sophisticated infrastructure sprawling over a vast area of land and well equipped with the latest technology based facilities. This enables our organization to operate in a well organized manner. Our state-of-the-art in-house manufacturing unit is operational with all the latest technology based machinery and equipment to carry out our manufacturing process in an efficient and speedy manner. This enables us to achieve our objective of bulk order. We are investing a large sum of amount from our annual turnover to adopt more advance techniques based manufacturing machinery to enhance our production capacity and manufacturing technology. We have been successfully serving our clients since 1982, with an aim of 100% client satisfaction.